Torc Mountain and the waterfall of the same name are synonymous with Killarney. The easily recognisable form of Torc is visible from most parts of the town and the surrounding National Park. Rising up from the shores of Muckross lake, it looms over many of the most famed beauty spots of the Killarney area. Of course Torc is not just an idle bystander in all this scenery, the spectacular Torc waterfall and its shouldered peaks are some of the most photographed scenes in the Killarney area. As Torc is situated only 7 km from Killarney town centre, it has an imposing presence over the town that sometimes makes it seem much higher than its 535m height. Growing up in Killarney meant that a trip to Torc Waterfall was a regular occurrence. Its close proximity to the town and ease of access made it a popular excursion for young and old on a summer’s day. A trip to the summit of Torc mountain came much later, probably due to too much emphasis on the “mountain” part. Climbing a mountain sounded more much like an expedition but this is certainly not the case with Torc. Many are familiar with the steps of ‘Cardiac Hill’ on the southern slopes of Torc. This route doesn’t quite reach the summit – it levels out and traverses the southern face before joining the Torc waterfall walking routes. Well, if you can manage Cardiac Hill, getting to the summit of Torc should be a walk in the park in comparison! There are basically two ways of getting to the top of Torc: The Long Way or The Not-So-Long Way. Both routes are equally rewarding but let’s just say that The Long Way involves more steps and a bit more huffing and puffing. For the purposes of brevity, we’re going to concentrate on The Not-So-Long-Way here. There are two main car parks to access the Torc mountain area – The main car park on the N71 road near the base of Torc and just a few hundred metres from the famed waterfall. The upper car park can be accessed by leaving the N71 about 1km earlier and following the road as it steadily ascends through the woods. As the name of the car park suggests, this means that you get a bit of a head start on the climb by commencing from the Upper car park. To find the upper car park at Torc, take a left turn off the N71 immediately after you pass the main entrance to Muckross House and Traditional Farms. Follow this narrow road for about 1 km until you reach a small car park where you start the walk. The initial section of the route is part of the Kerry Way long distance walking trail and is also the traditional starting point for the Old Kenmare Road route. Leave the car park behind you and follow the trail as you head towards the shoulder of Torc Mountain. You will shortly see the Owengarriff river on your right hand side. This river descends from Mangerton mountain before tumbling spectacularly at Torc Waterfall on its way to Muckross Lake. After you cross a wooden bridge over the river, take an immediate left. This first section contains a few sharp ascents to get the blood flowing. 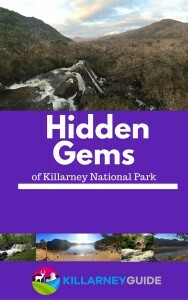 Before long, the trail exits the woodlands and emerges into the open expanses of the uplands of Killarney National Park. The southern face of Torc rises to your right and the river valley extends below you on the left. About 1.5k after you leave the car park you will see the beginning of the summit trail signposted on the right hand side of the pathway. Facilities None. Bring all required supplies. The trail meanders through the heather and rocks and soon you will reach the first of the boardwalk sections of the trail. These old railway sleepers will cover most of the route from this point forward. The boardwalk helps to keep your feet dry on many parts of the route but be careful as it can be slippery in places. In clear weather, there are no issues with navigation as the trail is quite straightforward throughout. The zig-zag nature of the trail helps to reduce the gradient of the ascent. A viewing platform has been constructed about half way up the slope to let you catch your breath and take in the views of the river valley behind you. Keep an eye out for the mountain goats perched precariously on the rocks on the far side of the river. Watch out too for the Red Deer as they make their way across the slopes of Torc with considerable ease in comparison to our plodding ascent to the summit. The white tailed sea eagles that inhabit Killarney National Park can sometimes be seen from this area also. These huge birds often soar over the slopes of Torc en route to Killarney’s lakes as they scan the surface for their next meal. As you near the summit, the boardwalk gives way to peat covered tussocks and stony tracks. The view to the Upper Lake to the south begins to open up and the ‘shoulders’ of Torc are now beneath you. As you take the last few steps to the summit, a wonderful vista opens up before you. A superb view of Killarney’s three lakes, the McGillycuddy Reeks and the Killarney valley beneath you. The Dingle peninsula stretches out to the west, and to the north the land rises gently beyond Killarney town. The descent route is to return back down via the boardwalk so navigation should not be an issue. Note: It is not advisable to descend via the steep slopes of the southern face of Torc. Torc mountain and its various parts more than justifies its billing as one of the top attractions of Killarney National Park. There is a lot more to Torc than what the majority of the visitors to its splendid waterfall get to see. Beyond the waterfall at the base of Torc, there is a smaller enthusiastic bunch that head up the stone steps beyond the falls to the upper slopes. The real step masters prefer the challenge of Cardiac Hill on the southern face of the mountain. After reading this you can now join the more elite group of ‘summiteers’ – those who reach the top via the northern slopes. The presence of a well maintained, low gradient boardwalk makes this a very achievable climb. If you start from the Upper Torc car park, the actual climb is less than 350 metres. It is well suited to beginners, younger climbers or those with limited time – most can walk to the top and back in less than 2.5 hours. The views from the summit are richly rewarding – and can be achieved with a lot less effort than you might think. Thanks for visiting Shane and taking the time to leave a comment.